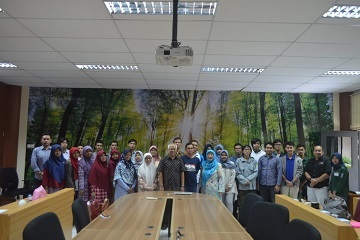 The Department of Biology, Faculty of Mathematics and Natural Sciences (FMIPA) and Department of Silviculture, Faculty of Forestry, Bogor Agricultural Institute (IPB) collaborated to hold Stingless Bee Cultivation Training for IPB students in the Ulin Room of the Silviculture Department, Faculty of Forestry, Dramaga Campus, Bogor (2/2). This training presented BEE's Global IPB (Bee, Environment, Ethics), Present at this training, Dr.Ir. Miftahudin M.Si as Head of the Department of Biology, Dr. Ir. Noor Farikhah Haneda, MS as Head of the Department of Silviculture and two expert speakers Dr.Ir. Rika Raffiudin M.Sc and Dr. Drs. Tri Atmowidi, M.Sc. from the Department of Biology, IPB. In addition, the training also invited a beekeepers speakers, Nana Suryana. IPB Global BEE is an Apiculture interest group among lecturers of the Biology Department of FMIPA IPB with the Department of Silviculture, Faculty of Forestry, IPB. The idea of its formation emerged during a meeting of IPB lecturers at the Fourteenth Asian Agriculture Association (AAA) conference in Jakarta. "IPB Global BEE is a joint communication between the Department of Silviculture, the Department of Biology, and the Department of Plant Protection. There are also lecturers from other faculties who are interested in participating," said Dr. Rika. "We hope this training can unlock the potential of bees, especially stingless bees. Bees currently known as insect pollinators play a role in ecosystem services. In the future, hopefully it can be in fields other than the environment, such as health," said Dr. Rika. Meanwhile, according to Dr. Tri Atmowidi, stinging bees is widespread in various regions in Indonesia. For example, teuweul (Sunda), klanceng (Java), galo-galo (Sumatra), kelulut (Melayu), and emmu (Sulawesi) bees. "Honey is not the only benefit that can be obtained from stingless bees. Stingless bees are also considered to be bee propolis. This type of bee can produce as much as 5.8 kilograms of propolis per year. Propolis itself is a resin that is collected by bees to build their nests. Nests are generally in a dark cavity," he said. The same thing was said by Nana Suryana. Nana said that if the bee likes it in an area, then they will settle down. The development of stingless bee cultivation requires only a dark place, close to the food source (nectar and flower pollen), and resin from the tree as a propolis base material.